About 5 months ago, I decided that I would start to research Pinup modelling and what it was all about. I cannot say that I have ever considered being a model. I am not one of those people who has wanted to be a model since I was in the womb or dreamed about it all my life. However, since the discovery of my love of pinup, rockabilly and all things vintage, I decided that I would like to give it a go, if nothing else, for fun! I also wanted to educate myself about it and understand it from a first hand perspective. 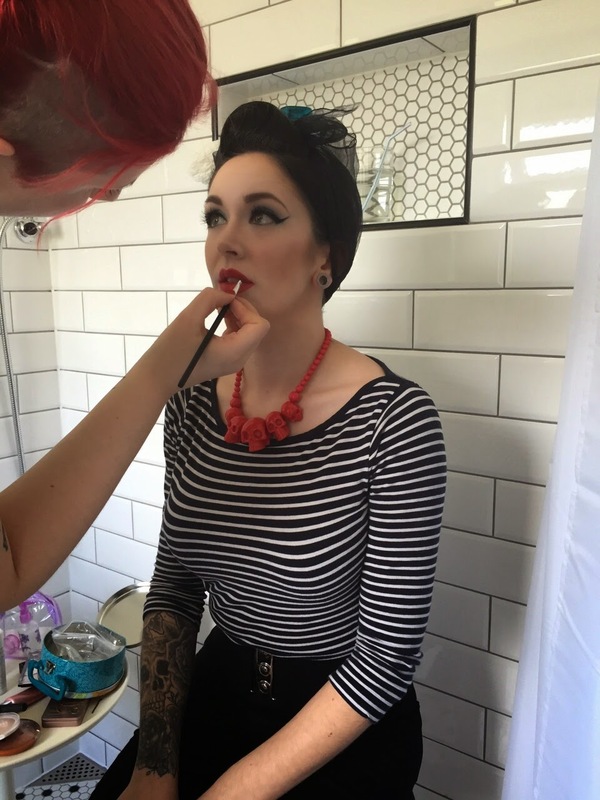 So I began scouring the internet for blogs and write ups on 'how to become a pinup model', the majority of which I found to be either completely unhelpful or really negative! I found a great article written by Laura Byrnes for Pinup Girl Clothing on Facebook which was written in response to what I can only imagine was a huge pile of enquiries from people like me! The article was brutally frank and basically said that, if you send a selfie to a modelling agency or clothing line, no matter how amazing it is, it will get deleted. Simple as that! Also, if you are anything less than 110% 'scrubbed up' (nails, hair and makeup etc all on point) you will not be taken seriously. I heard a quote from Danny Wallace on the Scroobious Pip Distraction Pieces podcast, on the way to the shoot and he said that the best way to get into something (like modelling for instance) is to just do it. So by that logic, the best way to get into pinup modelling, is to do pinup modelling! This way, agencies or brands can actually see whether or not you can actually model and what you look like in their clothes. Once you have done this, you can then start to build a portfolio of professional images which you can be proud to send to agencies or brands. So this was my first step - to do a pinup photo shoot. 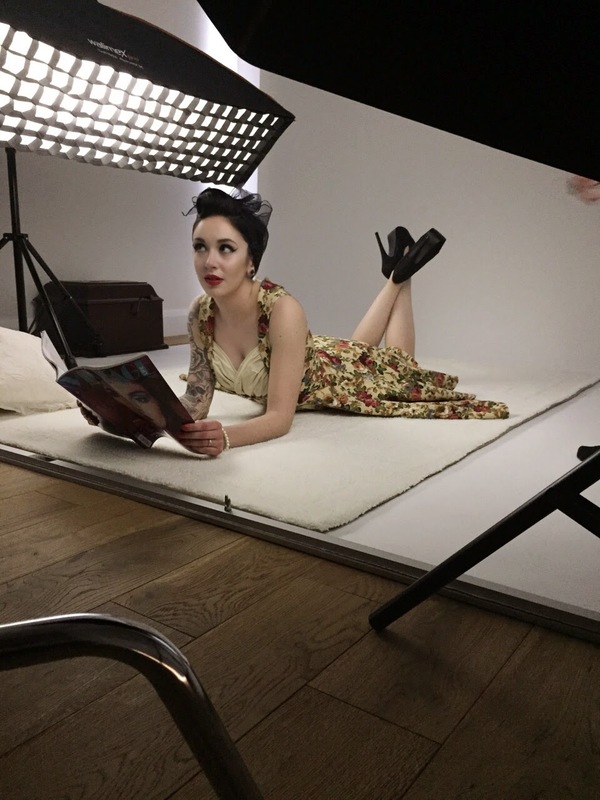 I searched for companies that offered pinup photo shoots in my area and failed miserably; most of the companies were either based in London or the Midlands. Not only was geography an issue for me, so was cost. I am sure that these companies do a great job, but they can cost an absolute fortune! Once I had figured out the cost of travel, accommodation and the shoot itself, I was up to about £500, which was just not feasible for me! So I did a bit more research and discovered the terms 'collaboration' and 'Trade for Print' (TFP). In order for a photographer to build a portfolio, he/she needs a model. In order for a model to build a portfolio, he/she needs a photographer. In order for a HMUA (hair and make up artist) to....you get the idea. There is a symbiotic relationship between these individuals. If a model, photographer and MUA can come together for a shoot which is of mutual benefit, no money will exchange hands, yet the resulting images will be shared with all concerned. This was a perfect solution for me. Now all I needed to do was find a photographer and MUA who was willing to collaborate. I had been following Pinup and Rockabilly model Laura Louu on Instagram for a while and noticed that she had done a shoot with a photographer called John Bellingham. I started to follow John, to get a sense of how he worked and who he was working with. After going back and forth liking each others photos for a while, I finally got in touch with John via email and asked him how he worked and if he would be interested in doing a shoot with me (stating quite clearly that I was not a model!). He was so incredibly helpful from the get go and not only made organising the shoot easy, but he also explained how it all worked from a professional standpoint, so that I was fully informed about the whole process. My Fiance and I decided that we would go to the shoot together. Having a chaperon with me for safety reasons was a sensible idea; after all, I had decided to meet up with a complete stranger that I had met over the internet for a photo shoot. I never had any doubt that John would be anything short of friendly and professional, yet having Spencer there made me feel even more comfortable. So my first recommendation is to always take someone with you to a photo shoot, if possible. We booked a date for the shoot and over the following weeks, myself, John and HMUA Marina Saliba added inspiration for the shoot to a Pinterest board set up by John. This gave us all an indication of the style of shoot that we wanted to do. I also emailed John pictures of the outfits that I wanted to wear, as well as information for Marina regarding my hair and skin type. As the shoot grew ever closer, to say I was nervous is an understatement. I was on the verge of having a panic attack the night before. What if I got all the way to London and I was completely useless, wasting everyone's time? What if it didn't turn out like I had hoped and I was disappointed? By the time we got to John's house I was very sweaty indeed! Yet from the moment he opened the door, he was so polite, welcoming and friendly that (some of!) my anxiety just melted away. He offered Spencer and I tea and coffee and we made our way to his studio. John's studio is on the top floor of his very lovely home in South West London and is extremely professional. He has a huge range of photography equipment, lighting, props and backdrops. Marina arrived shortly after us and we got straight into hair and makeup. Marina was brilliant and applied makeup suited to my skin type and features. There was not a mirror available for me to see my transformation, so it was not until after she had finished that I saw the final look. I was wearing a black and white stripey top at the time and the only thing that came to my mind when I saw myself was that I looked like a French mime artist! The make up was brilliant, yet massively exaggerated. I knew that this was required in order for it to show up on camera, but I was so used to seeing my face look a certain way, that it was quite unnerving to start with! So this is something to keep in mind! I arrived at the shoot barefaced and I had washed my hair the night before, so I was ready to go, which saved time. Getting my make up done by Marina Saliba in the dressing room. While I was having my makeup done, John utilised his spare time constructively and sat and chatted to me about modelling, photography, image rights, marketing, modelling safety, social media, agencies, magazines, publishers etc and gave loads of great tips. He has collected loads of inside knowledge from doing shoots like these and shared some really useful information with me. I could write a whole other post on this subject! With hair and make up done, we began shooting. Before each shot, John did a few 'test shots' to ensure that the lighting etc was correct. 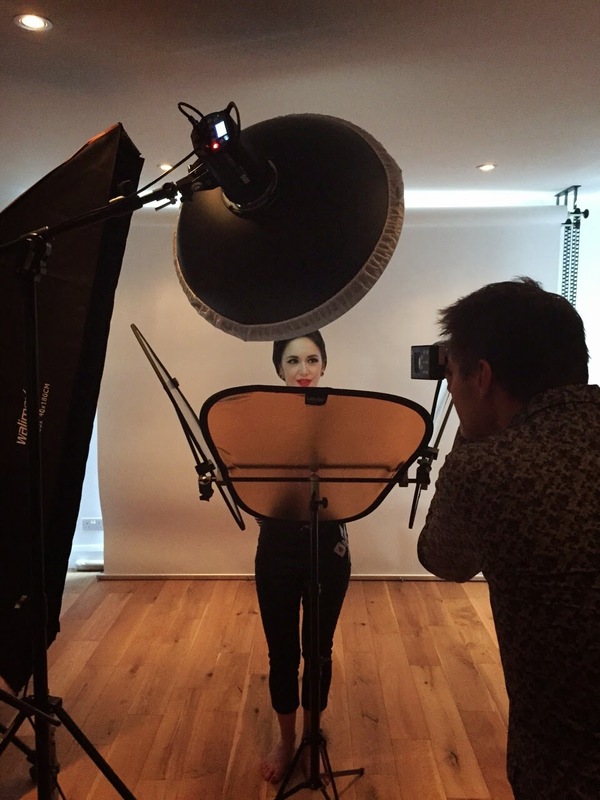 We then started with head shots and John used various lights and equipment, including a 'Beauty Dish' in order to create really striking close ups. He explained everything he was doing, as he was doing it, which really helped to calm my nerves. Looking back on the head shots, you can see how nervous I was. I was wooden and hardly smiled at all. My shoulders were hunched over and I really did not look like I was having fun! (even though I was!) It was not until the next set of poses that I really started to loosen up and get into things. John put on a Rockabilly soundtrack to get me into the 'pinup zone' and we cracked on with another outfit. John taking close ups and head shots to start. I had brought some outfits specifically for the shoot, including some Capris and some killer heels. I packed pretty much my entire pinup wardrobe with the view that it was better to have too many clothes than not enough, which John agreed was a good idea. I changed into my Hell Bunny Sadie Capris and a Collectif Dolores Top and used a glass Coke bottle from John's box of props. I started with some simple poses yet John did a great job of suggesting more advanced poses for me. He also said that I took direction well, which was a fantastic compliment for a novice! John set up an iPad on a tripod in front of me, which showed the images as he was taking them, so I could see where I was going wrong, which was really useful. I also had my iPad with me containing all of the inspiration from our Pinterest board for reference, just in case I couldn't get a pose quite right. Starting to relax in front of the camera! The first outfit shoot was great and the poses were well within my comfort zone, yet what came next was really quite tough! Bikini shots! I changed into a pinup style bikini that I have had and loved for a few years and started to play around with a few of John's props, including a hula hoop and some beach balls. We did a few shots standing up, then we did some floor shots. These came out great which I am really pleased about because I worked for them! The leg lifts that I did took a tole on my back and my stomach muscles, leading me to the conclusion that modelling is quite hard work! I really did ache the next day! After all the exertion of the bikini shots, we took a well deserved break for lunch! This is when things started to get tough! John had loads of really fun props which I could use. After lunch we did some shots in my House of Satin vintage style lingerie and my Speech Development Records t shirt, which was fun. We used some more of John's props including a vintage style telephone, chair and sheepskin rug. I did my costume changes in the comfort of John's bathroom come dressing room and I had all the room I needed to move around and be comfortable. John was really respectful of my privacy and made me feel completely at ease. The final look that we did was with John's Grandparent's gramophone from the 30's. I did some more floor shots in my Ophelia dress from Lindy Bop. These were not quite as taxing as the bikini shots, but by this time, I was running out of steam! Spencer and I also had a couples shot at the end, which was a lovely way to finish off the day. John called it a wrap and we all applauded each other on a good job well done! Wearing Lindy Bop for the final shot. It's time consuming: Prepping shoot ideas, myself, outfits, packing, travelling etc all took time and a lot of thought and effort. You have to be willing to put all this in to get what you want from the shoot. It can be costly: Although no money exchanged hands for this shoot, I did have travel costs and the costs of any pre-shoot beauty treatments and additions to my wardrobe to consider. Modelling is not cheap! It's hard work! : Although it may look easy, it's not! I was physically and mentally quite drained after the day, which is not only a reflection on my lack of fitness, but also an indication of how hard professional models must work over a 4/8 hour shoot. I was up at 6am and on the road for 7:30. We arrived at John's for 11am and I spent about an hour and a half in make up. We had about 30 minutes break for lunch, but shot non stop for the best part of 4 and a half hours. It's more difficult than it looks: It's just smiling into a camera, right? Wrong! It's not as easy as someone taking a picture of you at home. This may seem obvious, but you've got lights, equipment, people looking at you, unfamiliar surroundings etc. All of these distractions make it quite difficult. Practice makes perfect: Before I did this shoot, I did a lot of research into pinup modelling and poses that I wanted to do and tried them out at home. I worked on things that I felt were not quite right, so when I got to the shoot, I was not completely unrehearsed. This meant that both myself and the photographer had a much easier job! I also had quite low expectations of myself. I went into the shoot knowing full well that I am not a model and that the images may not come out as perfect as I would like - but that's OK! We all have to start somewhere! Take a helping hand: Having Spencer with me was great, not only from a safety point of view, but he also noticed little things which could impact on a shot (eg. labels sticking out of clothes etc) and brought me water, props, outfits and emergency Jaffa Cakes when I needed them! Having another pair of hands was really helpful. Hopefully this was useful for anyone considering doing a pinup photo shoot. As always, if you have any questions or would like to leave any feedback, please do so below. I would love to hear from you! And please do look out for the finished pictures on my Instagram!